Effects of dietary Mg on DM mice. (A) plasma Mg concentration was decreased in DM mice and reinstated by dietary Mg. Seven to 15 animals were tested for each group. (B) The cytosol free Mg level was decreased in DM mice, and dietary Mg did not recover it. Cardiomyocytes isolated from the left ventricle of 7–15 animals were tested for each group. 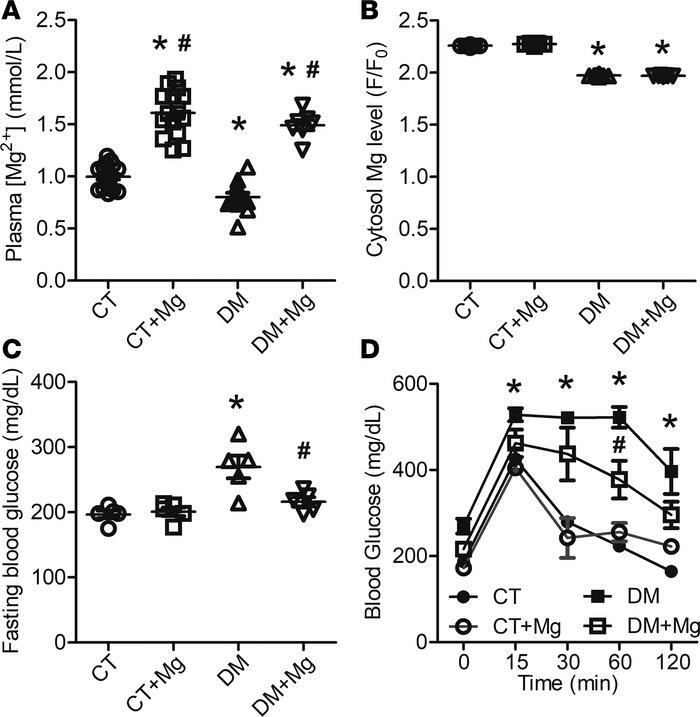 (C) Dietary Mg decreased the fasting blood glucose in DM mice. Five animals were tested for each group. (D) Dietary Mg decreased the blood glucose levels as compared with DM mice during the i.p. glucose tolerance test. Five animals were tested for each group. One-way ANOVA with Bonferroni post hoc tests for multiple group comparisons; *P < 0.01 vs. control, #P < 0.05 vs DM. CT, control mice; CT+Mg, control mice fed with normal chow and Mg in drinking water; DM, diabetic mice fed with high-fat diet; DM+Mg, mice fed with high-fat diet and Mg in drinking water.